Since I was 10, I wanted to learn about quilting, but I didn’t know anyone that could teach me. In 1983, at 21 years old, I joined the Canadian Armed Forces (CAF) where I met my future husband, an Acadian from New-Brunswick. Our first posting was in Gagetown, NB and, that’s where I learned the basics of quilting. The teacher, was my mother-in-law. There weren’t any quilting tools on the market at the time and the style was very traditional. In 1986, the Army, wanted women to go to field units. Because of this, we were posted to Valcartier, QC, where I became the second woman to serve in a field unit. Meanwhile we had two boys and I continued making quilts as a hobby. In 1991, the Golf war began and I decided to get out of the military to raise my children while my husband was sent to Cyprus as a Peace Keeper. In 1993, we were posted to an Air Force base in Portage-la-Prairie, Manitoba. When one moves to a new place, one must take the opportunity to learn as much as they can about the culture. At the time, oil painting was also a passion of mine so, to meet people in my new community, I started teaching at the Arts Council of Portage. At the same time, I met two amazing people that would teach me their culture through their Native Art. Aimée, an Algonquin from the Ottawa region and her husband, a Lakota Sioux from Long Plain, MB, showed me how to make raw hides for drums and shields; beadworks on moccasins, mukluks, mittens and bags as well as dream catchers and other ceremonial items. In hindsight, painting and Native Art gave me a new perspective that would drive my passion for quilting and designing into a new direction. In 1996, we moved back to Quebec. I became very serious about quilting and found a quilt book from Pam Bono’s collection that was quite different from the traditional quilting style of the day. Pam became my mentor. She sent me an invitation to visit her. I traveled to Colorado and stayed with Pam to learn the business of quilt designing. Pam and Robert, her husband and business partner, were amazingly generous people and shared their passion of quilting and business sense with me. They have been a great influence on me. In 2007, I had heard about Paper Piecing. I quickly mastered the technique and I was able to see how a pattern was designed. It was a Eureka moment as my need for innovation and the need for challenges were met with this unique way of assembling pieces of fabric together. I started to create my own designs and write quilt patterns. In 2008, I started my small business as a quilt designer ‘’COLLECTION INÉDITH’’. A play on word with the word ‘’inédite’’ which figuratively speaking means UNIQUE. It’s at the 2016 Canadian Quilt Show in Mississauga, Ontario, that I decided to add new designs based on Free Motion Quilting and Raw Edge Appliqué. 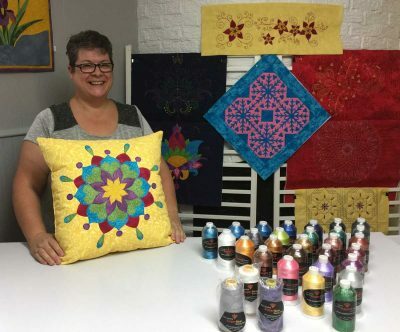 I launched my new Block of the Month design Collection. This new collection was design to be used with a domestic sewing machine. My collection of work is always evolving and reflects my personality. I love bright colors and I’m always on the look out for inspiration wherever I am. I’m passionate about creating new designs, I always find a way to innovate, I like transforming an idea and I love teaching and sharing everything I know.